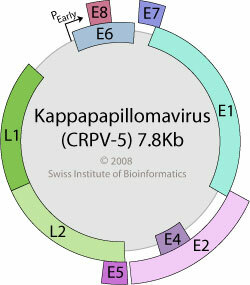 Circular dsDNA, about 8 kb in size, associated with cellular histones, encoding for 6 proteins. The E6 ORF is larger than in other genera. An uncharacterized E8 ORF is present in the early region. a) Early Proteins: non-structural regulatory proteins (E1-E8).